The White Holland is a white-feathered variety that originated in Europe, perhaps, though not certainly, in Holland. It was developed from Mexican turkeys brought to Europe from the Americas beginning in the 1500s. This population is likely to have included birds of many colors, including black, bronze, and white. 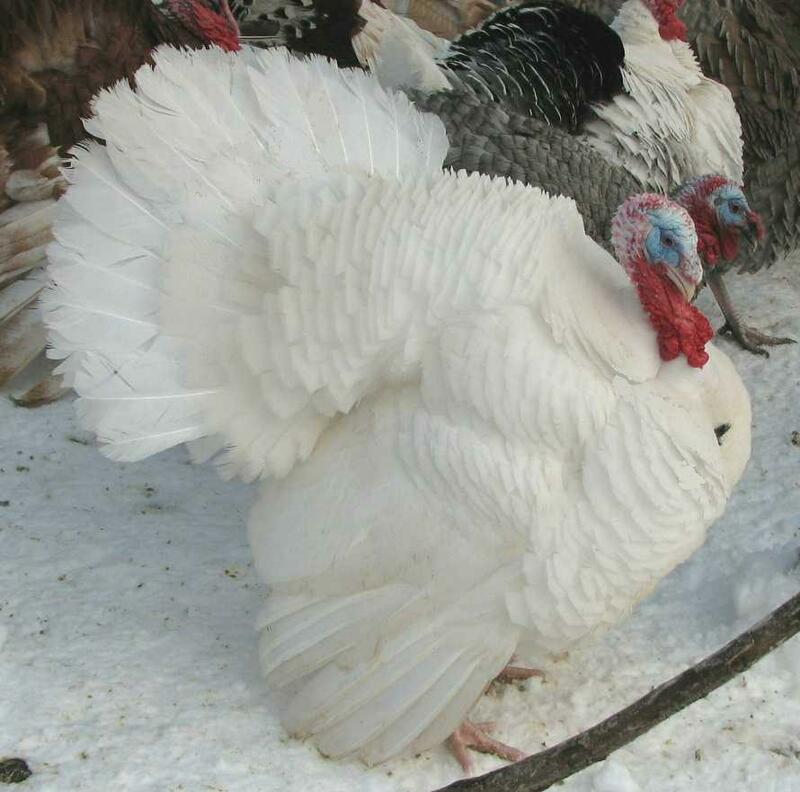 In some countries there was a prejudice against white turkeys as more vulnerable to predation and disease, though white turkeys were favored in Holland and Austria. They were documented in England in the early 1800s and imported to the United States not long afterward. The White Holland variety was accepted into the Standard in 1874. This variety became popular and has been important commercially in this country. The White Holland turkey is showy in appearance, with snow white feathers .The beard is black; the beak is pink to horn colored; and the throat and wattles are pinkish-white. Shanks and toes are pinkish-white. The original eye color was supposedly blue but the A.P.A. standard calls for dark brown eyes. The White Holland's advantage has been its lack of dark pin feathers and this trait often led to market advantage even though the birds were not as large as the Bronze. The White Holland was the only commercial white variety in the first half of the 1900s. They can breed naturally unlike the commercial Broadbreasted white,which normally has to be artificially inseminated to be able to reproduce. The A.P.A. standard calls for mature weights of 36 pounds for toms and 20 pounds for hens. (Brown eyed) (b+b+cc) Bronze based with recessive white genes. (Blue eyed) (BBcc) Black based with recessive white genes. Powered by website statistics and analytics software.